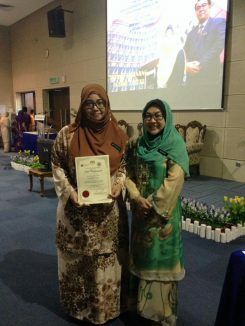 Alhamdulillah, I was the recipient of the Educational Technology award for my contribution at the international level. The merit is based from my presentation at MIT as well as my involvement as the Assistant Secretary for Malaysia Educational Technology Association (META) for the past two years. Thank you to Johor Educational Technology Division and Johor Education Department for the acknowledgement.